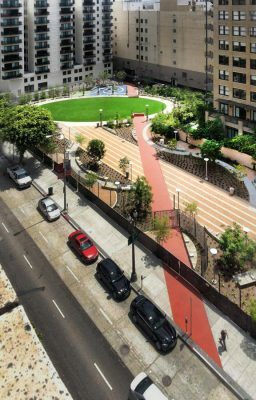 LOS ANGELES – Mayor Villaraigosa and Councilmember Huizar yesterday opened Spring Street Park in Downtown Los Angeles, the 16th Park in the 50 Parks Initiative. The Mayor also announced the City of Los Angeles has purchased a lot from the State of California on the corner of 1st St and Broadway to create a new public space adjacent to Grand Park and across the street from City Hall. Spring St. Park was designed by Lehrer Architects and is situated on .7 acres of land. It includes walking paths, an open lawn, seating, children’s play elements, native landscaping, and a smart irrigation system. The park’s planning, design, and implementation involved a collaboration among the Mayor’s Office, Council Districts 14 and 9, Recreation and Parks, Engineering, and local stakeholders, including “Friends of Spring Street Park,” a non-profit organization established to assist the park. Funding for Spring Street Park came from Quimby fees. Spring Street is the 16th park to be opened through the 50 Parks Initiative, which Mayor Villaraigosa launched in August of 2012. The 50 Parks Initiative takes underutilized properties, many left blighted from the housing crisis, and turns them into neighborhood parks in areas that badly need them. Each park includes safe and environmentally sustainable features that minimize park maintenance and maximize community impact. Over the past seven years, the Villaraigosa administration has added 670 acres of park space, more than twice the amount of the previous two administrations combined. The Mayor also shared details regarding the newly purchased lot on 1st and Broadway. At nearly two acres, the lot was the home of the first State office building in the Civic Center. In 1976, the building was demolished after earthquake damage and has been left vacant ever since. In June 2013, the City purchased the Civic Center lot from the State of California for $7.5 million. Funding sources included Quimby fees and interest, zone change fees interest, and the Department of Recreation and Parks capital park development funds. The Civic Center Park development will occur in stages, beginning with hazardous abatement. As one of the necessary steps to rebuild, a few dozen stray cats in and around the site will be rescued by CATS USA, Inc., and given to the Department of Animal Services. The Department of Animal Services will work with local humane organizations, rescuers, and members of the public to socialize the cats and find homes for them. None of the cats will be euthanized, and no cats currently in shelters will be euthanized to make room for them. Square footage: 0.7 acre, L-shaped lot, bounded by Spring Street on the west, an alley on the east, and mid-block between 4th and 5th Street. Lehrer Architects is honored to announce that Spring Street Park and Potrero Heights Community & Senior Center are both nominated for a Best of Year Award. Both architecture projects are national finalists in the “Outdoor” category.